Immunoglobulin refers to the breakdown of blood plasma that contains antibody and Intravenous immunoglobulin (IVIG) can be defined as a blood product administered intravenously. This therapy applicable for individuals who cannot produce adequate amount of antibodies. Intravenous immunoglobulin therapy helps patients with common variable immunodeficiency, Wiskott Aldrich Syndrome, X-linked agammaglobulinemia and other forms of hypogammaglobulinemia. This report identifies the intravenous immunoglobulin market size in for the year 2014-2016, and forecast of the same for year 2021. 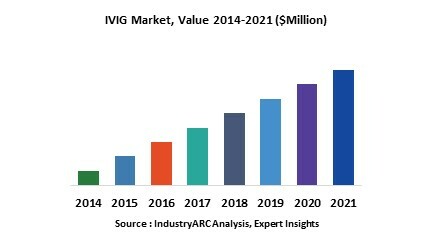 It also highlights the potential growth opportunities in the coming years, while also reviewing the market drivers, restraints, growth indicators, challenges, market dynamics, competitive landscape, and other key aspects with respect to intravenous immunoglobulin market. Globally North America dominated the market for intravenous immunoglobulin in 2015 with highest market share due to higher awareness about intravenous immunoglobulin coupled with developed medical and healthcare establishment in the region. North America was followed by Europe and Asia-Pacific as the second and third largest regional market respectively, for intravenous immunoglobulin. However, Asia-Pacific is expected to be fastest growing regional segment during the period of study due to fast growing healthcare setup in the region especially in India and China along with growing intravenous immunoglobulin therapy in this region. This report on global intravenous immunoglobulin covers different applications of intravenous immunoglobulin therapy, and also classifies the global intravenous immunoglobulin market based on the basis of route of administration and clinical trial phase and market size in various geographical regions. This is report has been further segmented into major regions, which includes detailed analysis of each region such as North America, Europe, Asia-Pacific (APAC) and Rest of the World (RoW) covering all the major country level markets for intravenous immunoglobulin in each of the region. 11.2. China Biologics Products, Inc.
11.10. Hualan Biological Engineering Inc.